The way information is presented matters. The way something is framed has powerful effects on our understanding of the issue (in this case, my friend was referring to a smaller MacBook screen). Simply put, context matters. And so it is with investing. Many people associate activity with progress. We’re surrounded by people touting stock tips and media coverage that inundates us with unreliable and conflicting information. ‘Passive’ brings images of laziness and ‘average’ is seen as settling, not excelling. In short, our societal understand of investing is not based in the reality of fact. Investing has been put in an incorrect context, and Daniel Solin seeks to remedy that in The Smartest Investment Book You’ll Ever Read. The book is refreshing: direct advice concisely written without any bullshitting. Solin begins by reframing smart and dumb investors. He proclaims smart investors to be those who invest for market returns through broad market indexes. Dumb, or ‘hyperactive investors,’ are those who have fallen for the illusion of being able to predict the stock market. Hyperactive trading is a fool’s errand. It results in higher fees and trading costs. There are typically unplanned tax implications that result from frequent trading. Portfolios tend to be unbalanced and fail to account for risk. The brokerage community is “fraught with conflicts of interest” and rarely does a broker serve a fiduciary role to their clients. In most cases, active trading (either on your own or through a broker) simply doesn’t make financial sense; it’s dumb investing. Individual investors will find it hard to overcome the above listed inefficiencies. This means that for most, market returns are not average, they’re superior. Solin’s studies show that over the long-term, 95% of managed money is unable to match the returns of the market. Warren Buffett makes million dollar bets about the S&P outperforming a portfolio of hedge funds. Both the logic and the numbers support long-term index investing. So if this ‘dumb investing’ methodology is proven to be ineffective, why do some many people continue to pursue it? Marketing. Brokerage firms excel in selling their services, and the financial media is invested (through advertising dollars) in convincing people to chase returns. Index investing doesn’t make money for the middleman, and thus there are many businesses that rely on persuading dumb investors to keep dumping money into their services. The book crescendos to the recommendation section: Daniel Solin’s smart investment plan. The plan is based entirely upon asset allocation and broad market indexing. It’s simple to execute and gets better results than the average person’s strategy. Find your ideal asset allocation based on your risk tolerance. A risk tolerance calculator is included on Solin’s website and can help you choose how to divide your portfolio. Your assets should be divided between a U.S. stock index, an international stock index, and a U.S. bond index. Open an account at one of the fund families. Solin specifically recommends using Vanguard, Fidelity, or T. Rowe Price as they are low-cost and uncomplicated. Some of the smaller funds are also possibilities, but you will have to purchase more index funds to achieve the same diversity that you can get with the larger companies. Select your investments. This is the easy part. If you have enough money to meet the minimums for the funds (usually this is $2,500 – $3,000 per index), then buy the appropriate broad market indexes in the fund family of your choosing. If you have less than $25,000 to invest, it may be hard to both meet minimums and achieve your ideal asset allocation. In this case, choose a lifecycle fund as this will allow you to achieve decent diversification with low costs. Rebalance your portfolio. As the value of your investments change, your asset allocation will change. You can rebalance by either selling some of the investments that have become overrepresented and buying those that are underrepresented, or you can just add new money to your portfolio and buy the assets you need to bring into balance. You should be able to rebalance you portfolio in less than 90 minutes a year. Solin’s book is extremely successful in convincing readers that passive investing truly is smart investing. His explicitly lays out simple and intelligent strategies and provides ample supporting evidence as to why his methodology is proven. The Smartest Investment Book You’ll Ever Read shows an easier and less expensive solution that delivers better results. All investors should read this book. I read this constantly on blogs, and I have not read this book but simply based on the review I can tell I’d be irritated the entire way throughout. Why is there an obsession by “everymen” to insist that any and all trading (ie, the “dumb” investors labeled above) is a bad thing. They are two different games played by two very different rules. This distinction is unfortunately not made enough, though it’s fairly straightforward and clear. It’s unfortunate that it is so often mislabeled as a “fool’s errand” or dumb when contrasted with investing advice. Ramit and others often find it necessary to announce that it’s impossible to time the market in every thread about investing, and while that’s true in the one context, time and practice and yield significant results via short term trading. They’re apples and oranges, and instead denouncing on consistently I think time would be best served explaining why they are different, and the rules of each game. You buy $100 worth of two funds each on January 1st. You go back to review your “portfolio” on December 31st to find one fund’s value is $150 and the other is $50. You are now out of balance. This advice says you should sell some of the $150 and buy some of the $50 so that you are in balance. The reason that is horrible advice is because it’s the opposite of one of the main tenets of investing which is…cut your losers and ride your winners. Be patient when you are right and impatient when you are wrong. Please don’t follow this advice, you will consistently be selling your good decisions so that you can double down on your bad ones. Jeff, since you don’t know which stocks or sectors will outperform over the long term, investors come up with an asset allocation and rebalance around that. Saying you should “cut your losers and ride the winners” is simplistic advice that misses the point that you can’t predict what will happen, especially in the short term. In Chap 6 of my book, for example, I show you how some of the very same funds that were top performers one year were some of the worst performers just a few years later. You really want to play the picking game? I bought into the Vanguard Total Stock Market index back in May of last year. I only bought this particular fund because of the relatively high starting price for the fund ($3,000 at that time). I would have like to have gotten a more balanced portfolio at that time, but unfortunately I didn’t have the money to buy enough of those assests. So yes, as Ramit notes, you may need upwards of $25,000 to get a balanced portfolio. Brian, if you open an IRA (roth/regular) and have money deposited every month, many places will waive the fund minimums and allow you to purchase with what you have available. I have a couple of comments. My first comment is that I have read this book and agree that it is a great read and has great advice. My next comment is in response to Jeff’s. I don’t think your outlook of cutting your losers and ride your winners is correct. Of course there are times when you need to cut a consistently underperforming fund and on the other front you wouldn’t want to completely wipe out a fund that consistently performs well. That being said, rebalancing is basically the act of selling high and buying low. This is assuming you haven’t invested in some junk funds and that all of the funds in your portfolio are long term investments that will, over the course of your working career, provide you with good returns. If you look at studies that compare two portfolios, one that rebalanced and one that didn’t, you will see that the one that rebalances, even if only once a year, will outperform the other. Hi Lance, thanks for having the discussion. I’m guessing that my points are just not well communicated because I don’t disagree with what you wrote. All I’m saying is that if you limit your max loss to 7% of a purchase while allowing an appreciating asset to accumulate profits while moving up your stop so as to not give back all your profits, you will have a very high return in relation to risk assumed. And you’ll avoid getting killed. One big problem we have right now is the notion that investing for the long term and riding it out is a sound strategy. Stocks are worth today what they were 12 years ago. Just because someone has time on their side doesn’t mean it’s a good idea to ignore sound risk management. If you exited after a 7% max loss in 2008 you would now be well positioned for 2010 because of it. Those who rebalanced would be holding different versions of losers which has never helped an overall portfolio return, in good times or bad, long or short term. Most average people aren’t trading to play the stock market, they’re investing to save for retirement. But both are called ‘investing.’ The reason books say that index funds are ‘smart’ and timing the market is ‘dumb’ is to teach those who don’t know the difference, that index funds are better for retirement. Certainly TRADING on the stock market is not dumb if you can devote a lot of time and energy … but most people don’t do that, so index funds are smart for them. I’m about to open a Roth IRA and have been debating between Vanguard’s Total Stock Market index and the their Target Retirement 2050 fund. Since I only have the minimum amount to open an account, I’m leaning towards the 2050 fund to get the little bit of diversification that I want–just as the book suggests. Very well written review Rachel! Jenni, What is so hard about explaining the difference between the two? Just because most people don’t have time to learn to trade doesn’t mean it’s acceptable to call it dumb. That’s like an overprotective parent telling their kid there’s monsters at night so they wont sneak out. Explain the difference and educate people why and when you can use each strategy. I don’t find it acceptable to put out misinformation just because “most people don’t have time to learn the difference” but it seems like that is the accepted position amongst these types of authors and bloggers. Limiting yourself to a 7% loss seems like a sure way to insure you always sell in a volitile market like we have right now. Once the sale occurs how to you judge when to buy back in? Wouldn’t you have to know how much lower the market is going to go? You suggest 2010 as the time for a market recovery, but what if you miss a big rally because you misjudged the market recovery? It seems like your strategy is just a variant on timing the market. As for winners/losers- how can you really call a particular index a loser? It’s an asset class not a single company. Does a bad year for the S&P 500 mean that all 500 companies are now losers? Even if large cap stocks as a group don’t do as well as small caps in a given year or two- does that mean that that trend will continue? Logically it can’t or no one would consider investing in any asset class but the winner. I’ve seen data that showed the best asset class shifting from year to year- thus the only way to own the winner was to own all of the asset classes. I’ve been playing devil’s advocate in my mind ever since “the great recession” hit. I really start to wonder if “the market” will go on forever as a “smart investment” and if the fundamentals behind it (it will correct itself, it will always go up, its indicative of all known value, etc.) will always hold true. There are so many companies that have been ruined (and ruined people’s lives) and the market wasn’t there to fix it: Enron. If the market behind one of the biggest forms of investment, housing, isn’t smart enough to prevent the stuff that has happened… hmmm. I don’t know what to make from all of it. Just typing-out-loud… wish I had a point. Exactly, you would have wanted to sell in this market. And to answer the question of when do you get back in, I don’t know. I just threw 2010 out there and maybe I shouldn’t have been so flippant. I may not know when to get back in exactly, but I know that when I do if I’m wrong I’ll only lose 7%. If I’m right I’ll make solid if not spectacular returns. And the reason I’ll get back in is because of sustained strength and growth and not because I’m afraid to miss a big rally that may or may not be sustained (they have been worth missing for 18 months and counting). Regarding winners and losers, what I mean is that any liquid investment you hold that goes down 7% from where you bought it is a loser. Period. For now. Stock, bond, index fund, ETF or baseball card. Asset class is irrelevant. This is about portfolio risk management. If the market has spoken and decided that you were either wrong in the direction or wrong with your timing or both, you get out and re-enter when you feel more comfortable. Different strokes for different folks. I just think that the reason we are in this mess is that we have lost our prudence and cynicism to the point that sitting in an index fund an watching 50% deteriorate isn’t regarded as a questionable strategy. Thanks to you and the other commenters for making me think even more than I usually do about the validity of my thoughts. I haven’t read the book (as is the case with some of the readers above) but I’d like to comment on the general premise of the book. Firstly, stating that brokerages only market active-type funds because that suits their model is an unbalanced statement. Unless you complement the statement with the proposal that passive fund managers have an interest in telling people that you can never time the market and you can never trade well. Remember that passive funds have their own model which requires huge assets under management to make their miniscule fee % sufficient to generate cash to keep the lights on. I think that it is a poor message to send to people that you can never manage your money effectively except just follow the market. It encourages people to follow bubbles on the way up and then follow busts on the way down. The world of investment book promotion is a strange one and seems to have no problem with “cognitive dissonance” – whereby you experience discomfort because of trying to hold two opposite thoughts in your head. Investment books lionise Warren Buffett and try to teach us how to invest like him (stock picking) and then sell us books that say passive investing is the only way to go. It is possible to trade better than the market, if you take the time to learn how, rather than being led by the nose by your stockbroker (check out Reggie Middleton at boombustblog for a small example). Yes, not everyone is suited to investing actively, but that shouldn’t stop people trying to learn. 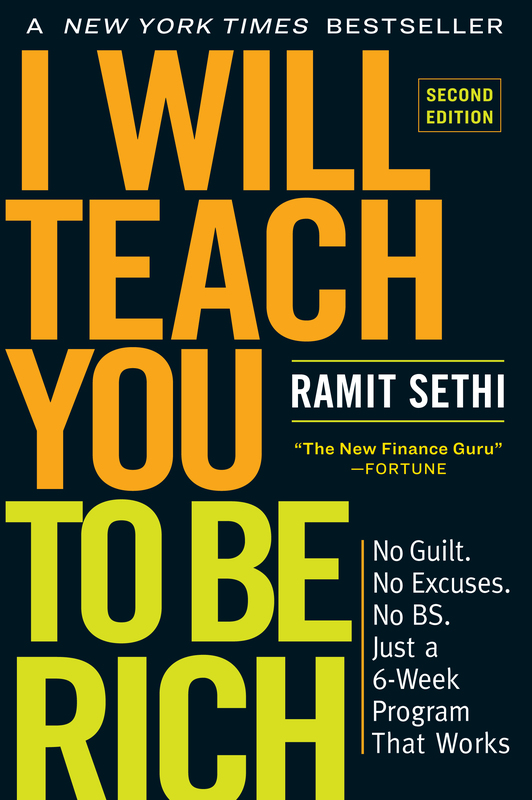 In the same way that everyone is not suited to managing their personal finances, but it shouldn’t stop them trying to learn, from someone like Ramit! Secondly, Jeff and Nathan – thank you for being voices of reason in this discussion that seems to be dominated by the modern version of a pitchfork- and torch-wielding crowd. Thirdly, I am (at least in your words) a “hyperactive trader.” My portfolio went up by 71% last year. So far, it’s up by 53% in 2009. I am 22. Just because most people are too stupid, lazy, or ignorant (or even worse – all of the above) to learn the basic financial literacy, doesn’t mean that nobody ever succeeds. Night Runner, I corrected the spelling error above. I don’t think they goal of the book is to tell people they can “never manage their money effectively.” But the fact of the matter is that most people don’t. The Paradox of Choice documents that people’s participation in their 401(k) plan drops by 2% with the addition of every 10 mutual fund options. And most 401(k)s have a very limited choice of investments. If the general public has trouble making a decision between, let’s say 50, pre-defined funds, imagine how astronomically more difficult investing must seem when you must choose between every option in the known financial universe. The point of the book is to show people they have options when it comes to investing, and the options are not necessarily technical or intimidating. You don’t have to hire a broker. You don’t have to follow the hot stocks, hopelessly confused but trying to catch the return anyway. You don’t have to diligently watch stock tickers all day and try to figure out what they mean. The ultimate goal of the book, in my view, is to show that the barriers to entry are much lower than most people think. I appreciate the people out there who have their own methods and feel confident enough to try their own investment schemes, but realistically that’s not a reasonable solution for most people. I applaud that your returns, especially if you can keep them up year-over-year. Hell, it’s great that you even know your return, because most people don’t have a clue. I would be even more impressed if you could tell me your portfolio’s standard deviation, and I sincerely hope it’s less than 30%. The argument of the book isn’t that most people CAN’T learn these things. It’s just acknowledging the truth that they probably won’t. And that’s why investing for market returns becomes the fiscally smart thing to do for the average investor. @ Rachel – I appreciated your review and your comment above is well thought out and well written. I agree with most of what you said. I would like to add though that when you say, “The ultimate goal of the book, in my view, is to show that the barriers to entry are much lower than most people think.” might be part of the problem. Maybe the barrier to entry shouldn’t be so low. Some would argue that the barrier to entry became too low for mortgages, consumer credit limits and Wall Street risk managers. I mentioned in a previous comment that we have lost our prudence and cynicism. Maybe the barriers to entry should be raised a little until that changes. Along the same lines, if “investing for market returns becomes the fiscally smart thing to do for the average investor”, maybe the average investor should invest their money into something where their knowledge and abilities are not “average”. I just finished this book based on the Rachel’s Review. I have to agree with some of the posters situations in that (A) I already had invested in index funds (B) I also had invested in Fidelity 2040 Retirement Account (C) Around 40-50% of my portfolio has been wiped out . Its complete BS that Solin mentions that the most you could lose on an Index fund is around 20%/year. Therefore I conclude that the advice in this book should be used with caution for the average investor. Its an interesting read anyway, do yourself a favor and borrow this book from the library for free (available in Santa Clara County Library). I’m curious as to the thought of asset allocation as a form of risk mitigation. If the whole market is highly interconnected, how is this true risk mitigation. Taleb would argue in favor of a Black Swan approach to investing. Why is this thought only with him? Why not make really conservative investments, say treasury bonds for 95% of your investments, and hyper-aggressive, risky bets for the remaining 5% of your portfolio (say your own company or your own education or other unique potential for high positive upside)?